This book was written by a candidate with presidential ambitions -- John Kasich ran for president in 1999-2000 after retiring from Congress after 9 terms. But he didn't write it while he was running for president -- he wrote it while he was running for Governor of Ohio in 2010 (he won). The contents of the book describe the period in which he served as a member of Congress, from 1983 to 2001. During his time in Congress, Kasich met every other Monday for a Bible study group with other like-minded men. This book's primary purpose is to describe how the Bible study group got started; how it came to be the defining event of Kasich's life; and what he took from it for the rest of his life. It's not actually a political book at all; but of course, since he was serving in Congress at the time, Kasich describes numerous political viewpoints. So why did Kasich write this book? One might think he is planning to run for President again. Certainly, with a governorship under his belt, he is much more eligible in 2016 than he was in 2000 with just Congressional service on his resume. And perhaps he wrote it to shore up his support in the religious community during his gubernatorial run. But mostly, we think he wrote it because he wanted to tell the story -- Kasich's way of spreading the Good News of his biweekly Bible study group. Our political excerpts appear below (and some religious excerpts). But we want to comment on one of Kasich's biblical interpretations. He describes Moses as "aggressively" working hard to get an audience with the pharaoh to get an audience: "How a guy like Moses ever returns from his exile to have a private word with the pharaoh is itself remarkable. How do you get that done? It's like calling the Oval Office and asking for an appointment." (p. 131) Moses is just a guy returning from exile? That's not what I read in the Bible! Moses was a fallen prince, who would have become pharaoh himself had he NOT been exiled. Would Pres. Bush have accepted Al Gore's appointment request at the Oval Office? Yes, I think so -- Bush exiled Gore to the political wilderness; therefore, Gore could certainly call up anytime. And just like Gore knew the private phone number from his time as V.P., Moses knew the private means of contacting the pharaoh from his time in the previous pharaoh's administration. In other words, we disagree with Kasich's biblical interpretations as much as we disagree with his political interpretations. But you can read the book for either one. John Kasich: Admire pregnant women who don't treat cancer to protect baby. John Kasich: Admires courage of Aung San Suu Kyi & Rosa Parks. John Kasich: Columbine victims showed courage by not renouncing God. John Kasich: It's God's job to judge if punishment fits the crime. New Testament: Speck in his eye? God should judge, not Man. John Kasich: Daughters attend a Christian school. John Kasich: Bible stories are historical facts. John Kasich: Did earth come about on its own? Evidence says No. Old Testament: David beat Goliath because he practiced and had faith. Old Testament: Some Bible stories are metaphors; some are historical facts. John Kasich: Bible study group swelled during 1992 House banking scandal. John Kasich: Separating church and state is goofy misinterpretation. John Kasich: Belonged to Bible study group for 20 years. John Kasich: I find God every other Monday. John Kasich: Learned faith via pastor dying of cancer. John Kasich: Sought God after parents' death in car crash. John Kasich: Living life of faith can be a liberating thing. John Kasich: Biblical manifesto: old law is gone; have faith in God. John Kasich: Objective moral values have existed since Creation. John Kasich: Hosted Fox News program "Heartland with John Kasich". New Testament: Romans 12 manifesto: old law is gone; have faith in God. John Kasich: Faith matters, but so does building up expertise. 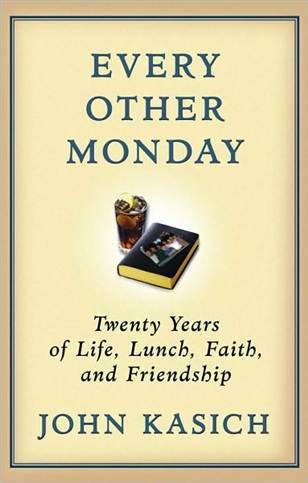 Twenty Years of Life, Lunch, Faith, and Friendship, by John Kasich.